This is request from Bambie. 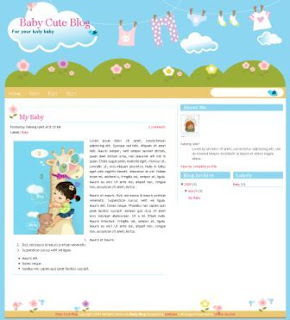 Baby Cute template three column version. Thanks for your support. You can check this post for two column version. hai nanya dong...cara,masukin ke bloggerny gmn sih? krna kodeny brbuntut .xml dan bukan .htm saya jadi bingun cara memsukan ke blogger saya. @gcci: blogger kamu masih template classic, ga bisa pake xml. HTML sangat terbatas. Upgrade dulu ke template new blogger. di edit html ada menu upgrade template kan? koleksi templatenya keren2.. amanda udah lewat... salut. Great work and effort Cebong Ipiet! Very nice! One question please: How do I replace the 'moving' header with a simple static graphic header instead? Which codes I need to delete(replace)? Thank you! @mattias: thanks for visiting, this template doesn't have moving header. Did you mean flower garden template? btw gimana sih caranya isi halaman "EDIT"
wow... apik.. suwi gak mampir, kakehan mektor..
Hihi, lovely and nice template you've created out there. anyway, can i know how to the RSS= FEEDS? and the photos, can i scratch to the max where makes it jz fitting and it wont cover my words? i have used ur templates but i notice that the date is not shown in my blog. is it suppose to be that way? apa di blogger bisa bikin beberapa links untuk satu alamat blog? seperti mau mengisi tab "kontak kami" perlu punya link, nah bikin link itu di satu nama blog gmn? jadi tidak buat blog baru lagi. lovely template.. ^-^ 4 Cebong Ipiet, ak mw download y.. thanks. Hi! looooooove all of your templates! mcm mane nak hilangkan tab edit sebelah home tuh,? hmm need more help please..sorry cos me new to html..
kan itu ada tulisan edit nya bisa di ubah ga ya? I've used ur templete but with some modification. Feel free to visit it. And thx dear. Thanks for this one! I use it for my youngest daughter's blog...too cute! hi there, i am using these themes as well, could you make it into 3 column which is with left and right side bar one? as for the pages, can i renamed it according to mine? by the way, it's very nice and clean one.thanks. im using this template but on my blog the blogger navbar is not visible on top. would u be kind enuff to explain how to make the blogger navbar visible (ada balik) again? pls haf a looksee, saya ingin banget navbar itu muncul..
Hello.. im using this cute and nice template. however, i notice that there is no link to older post and newer post. Any advice to fix this error? I really wanna use this cute template..
macam mana nak downlod dekat blogger??? boleh bagi kot html tak?? Does this have an HTML code? I don't know how to use it? I am new to this stuff so not quite sure?? Hi, bagaimana nak fix problem ni? Gadjet dekat my page jadi ke kanan.. This is such a cute template! I am using it on my blog now. Could you please give me any tips on how to do this? Or, if you EVER had the time, would you possibly make another version of this with a drop down menu in the future? It would be GREATLY appreciated. I can't even tell you how much appreciated---because I can not figure it out. I know you are probably very busy...but well, I could really use your help!! Definetely awesome 3 column template, thank you very much for this.. Hi...I love this template..Awesome! Unfortunately, downloading the file is like ages! Any ideas how to get this template? Hi..I love this template! I would like to download it and use it...Sayangnya, download file ini takes ages! :((. Ada ide lain untuk saya download file template ini?